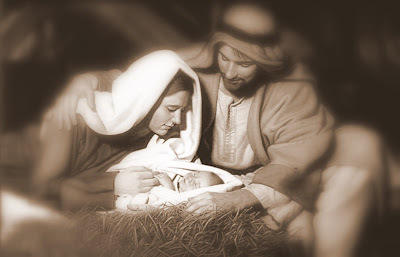 What joy must have coursed through the heart of Mary and Joseph as they examined their newborn Son! What thankful hearts they must have had! I am so thankful today for the blessings of heaven that has flooded my life, my husband, my children, my grandchildren, my parents, my grandparents my siblings and their families…and many more family members and friends that are so dear. I am thankful that my family will gather together at my house for Christmas this year. I am thankful that even though things seems tough at Tiffany’s house this year….praying for an unsaved spouse is making it so….God is working. I am thankful for the little ones that have blessed our home through Tiffany and Jared. Her three and his two! Ahem…five is what that is…. I am thankful that Tiffany made Christ the Lord of her life in September of this year. I am thankful for Lynn and Dineen who took my child on their hearts and cried out to God on her behalf. They did not know her….but they didn’t have to. God knew exactly where she was and how to reach her heart. I am thankful that April and David are happy and healthy and working for the Lord in their church. I am thankful that little Cy is a growing, happy active little man! I am thankful that God is Lord of my life and keeps close watch over me. I am thankful for His mercies, for they are new every morning! I am thankful for the coming 2008. Who knows what is in store….just keep your hand in God’s hand….you will feel His strength and love as He guides us through to fulfill His purpose for our lives. I am thankful for Laced with Grace …..and what each writer has written on the pages of my heart this year. I am thankful for Christian Women Online Magazine…for the love and encouragement of Darlene….the love of new friends I have met….if I start naming names I will forget someone dear to my heart….so just know that each of you have touched my heart in an amazing way. To be blessed by more Thankful Thursday posts, head over to Lynn and Dineen’s place at Spiritually Unequal Marriage….it will definitely bless your day! This entry was posted on Wednesday, December 19th, 2007 at 1:50 pm	and posted in Missions. You can follow any responses to this entry through the RSS 2.0 feed. What a great and very blessed list! You are a sweet blessing dear one. What a wonderful list! Thank you for sharing! Please pray for me to keep my hand in God’s hand. Blessings to your family at Christmas and in the new year. Happy TT Angie,Oh yes, so much to be thankful for! God is so good.I’m especially excited about Tiffany giving her life to the Lord. It just doesn’t get any better.Blessings to you and your family.Merry Christmas! This is my first visit. I’m thankful this Thursday that I found yourblog. It sounds like you do have much to be thankful for. So glad your friend Tiffany trusted Christ this year and that you are encouraging her and her family. Enjoyed reading your post, and God Bless! Very nice list!! And like you I love the Thankful Thursday posts, because they are just a blessing to me too! And I’m thankful for meeting you in bloggyland! May God continue to bless you with His joy and peace! I think that being a part of Thankful Thursday has caused my heart this past year to ponder on so much more of what God has done for me and my family. I’m more aware of the little things that He brings across my path as His little kisses from heaven to me. Thanks for sharing your heart today. And thanks for stopping by my place. Blessings and Merry Christmas!! Your tender, thankful heart has touched mine. Thank you dear sister! This is also my first visit to your blog. Such a wonderful thankful list that you have…thanks so much for sharing them with us all.Have a very Merry Christmas!! Angie, I’m rejoicing with the angels for your dear Tiffany – and in advance for the 5 kids and the unsaved spouse. I believe God hears those kinds of prayers with pleasure. Thanks for sharing your thankful heart! May you and your family have a wonderful Christmas celebration together! Great news about Tiffany. I do not know her personally -and I think this is my first in here- but I’m glad she made a wonderful decision in accepting Christ. Another saved soul is always a great news!Merry Christmas to you and your family.